MAKE UP FOR EVER recently released a few holiday sets, and today I have the All Eyes On You Set* to share with you! I've tried out quite a few products from MUFE this year, and I'm really enjoying the brand. The All Eyes On You Set contains 5 products, 4 of which are full size! A limited-edition set of MAKE UP FOR EVER’s essential products to transform your look from soft shimmer to dramatic glamour. 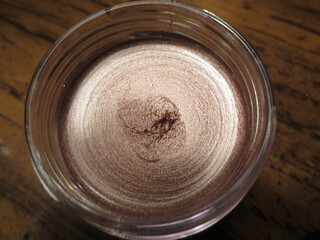 Highlight the eyes and cheeks with Aqua Cream, a crease-proof cream shadow that provides rich color in one application. Use Aqua Eyes’ award-winning, smudge-proof formula to line and define the eyes. Enhance your look by adding volume, length, and curl to your lashes with Smoky Lash mascara. Finish by evening out the complexion for a soft-focus effect using HD Microfinish Powder. I'm already in love with the HD Powder, so I'm glad to have a backup! I apply this powder everyday with a kabuki brush, after I've applied my BB cream or foundation. The HD powder just transforms my skin, making it look flawless and smooth. I highly recommend trying out this product! 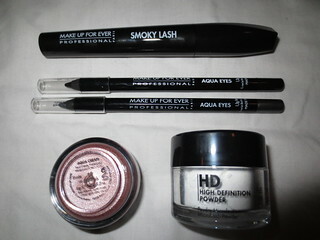 Aqua Cream is a really great base product for eyes. 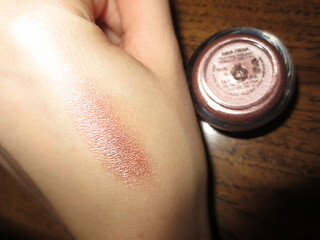 16 is a gorgeous pearly pink colour, it would be beautiful on its' own, or with other powder shadows layered over top. 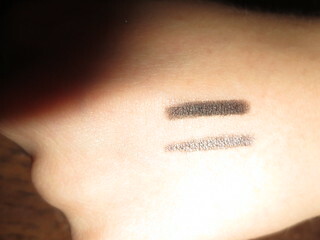 Two full sized Aqua Eyes eye liners are included in this set, 0L (Black) and 21L (grey). I've been using 0L lately, and I really like it! It isn't the blackest black that I've ever used, but it is still nice. And finally, a full size Smoky Lash mascara! I've heard rave reviews on this mascara, I can't wait to try it out for myself :) I'm using Maybelline's Colossal Cat Eyes mascara now, but Smoky Lash will be the next mascara I use. This set is a great value at $65 CAD, and I think that it makes a great gift for any beauty lover. I love that this set contains very wearable products, I really don't think that any of these items will go unused. Items like these are the basic products that can be used every day. If you wanted a full review on any of these items, leave me a comment or tweet me @opiaddict and I will do so! That Aqua cream is such a gorgeous color!! I'm dying to try out the HD powder! And the Aqua Cream is gorgeous.